It's a sunny day in New York and the reflected heat off the pavements is unbelievable. I walk into Bouchon Bakery at Rockefeller Center. There's air-conditioning. I like it already. The bakery is airy, with tall ceilings, cream and yellow walls, and marble countertops. And, despite its proximity to one of the most over-touristed sites in New York, the staff could not be nicer. M meets me, and we scan the glass cases of pastries and viennoiserie. We have a hard time choosing, but she orders gazpacho, a chocolate bouchon, and two macarons (one raspberry, one caramel). Picking a chocolate macaron is easy for me, but then I spot something gorgeous -- a craquelin. One of the girls behind the counter explains that it's brioche with candied orange zest and tiny sugar pearls on top. 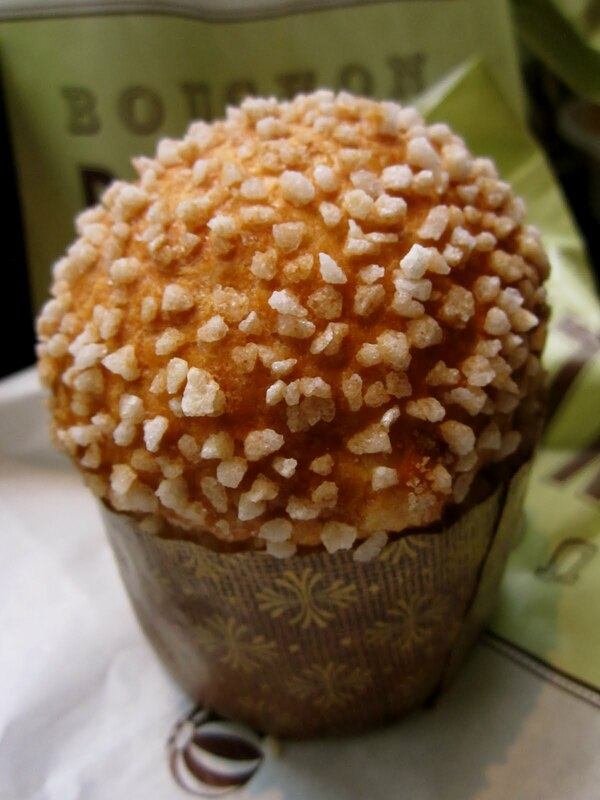 She had me at brioche. Because I woke up too early and I need more caffeine, I ask for an iced latte. When the barista misunderstands and pours me an iced coffee, he apologizes and quickly makes the latte. We sit at a tall counter near the front windows and look out on Rockefeller Plaza. M swears by the bouchon, but I don't steal a bite in time and it's all gone. The craquelin is lovely -- buttery as brioche should be, but lightened by the citrus taste. We're confused by the raspberry and caramel macarons -- What is buttercream doing in a macaron? It's too heavy and buttery and it doesn't work. And, to be blunt, the raspberry doesn't taste like real fruit. But the filling in the chocolate macaron is dark chocolate and has the texture of ganache. It's good. Very good. And, when it's time to go and to make our way through Midtown, I'm loathe to leave the bakery. This is a place where the afternoon is calm and wonderful things happen with flour, sugar, and butter.